These are some gorgeous works of art for your kitchen! 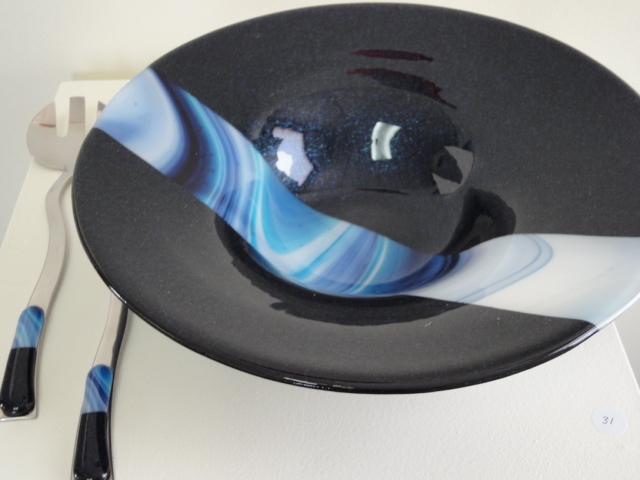 Sow’s Ear Studio & Gallery on Upper Union Street in Schenectady is showcasing the work of fused glass artist Cheryl Gutmaker in an exhibit called Functional & Fanciful Glass Art. Exhibit will be on display until Saturday, February 26 – only one more week! Sheet glass, rods, frit (small pieces of glass), torches, blow pipes, kilns, grinders, glass saws, lap wheels and soldering irons are just a few of the items we use to create our work. Many of our pieces incorporate two or more methods of working the glass. Some of our fused pieces go through the kiln process two or three times. Each firing involves the controlled raising and subsequent lowering of the temperature over many hours, and in some cases, days. All of our pieces are unique. Since each item is handmade, no two are exactly alike. Color variations are normal and may reflect different peak temperatures or different runs of glass. Dishes are food safe. All our glass objects may be hand washed with mild soap and water. Sow’s Ear Studio is located at 1597 Union Street in Schenectady. More information by calling (518) 370-2042, or at www.sowsearstudio.com. Regular gallery hours are Mon– Sat 10:30am – 5pm.